I have reasonably good sight, but I'm still having problems recognizing which button is pressed in the election. I know there's a list on the right side, but it's not anchored and disappears when you scroll the page down. 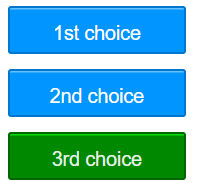 That leaves the buttons as the only way to see your current selections. Could we add some contrast between those two shades of blue? In a related problem, it seems that the "selected" state is inconsistently used. Also the text would better look vertically centered. Browse other questions tagged feature-request design election usability . Vary position of the formatting buttons at the bottom if the user is on a tablet? What's with the new comment buttons border?